In three quick games, Samuel Charron has shot up the Canada Para Soccer goal-scoring leader board. The Ottawa-born midfielder has suddenly moved into second place on the all-time list, scoring an incredible 10 goals in three international matches over a long weekend in Denmark. 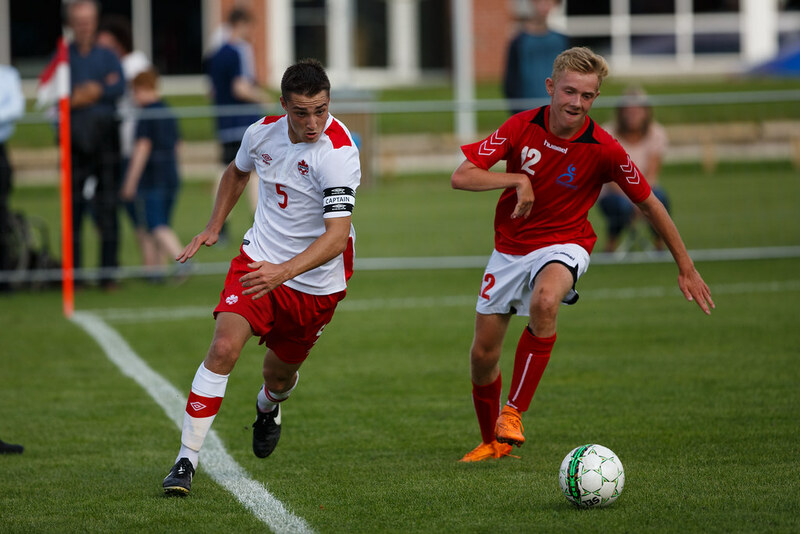 In Vejen for the 2016 IFCPF Qualification Tournament, the 18-year old Charron started his heroics by becoming Canada's youngest hat trick hero in a 10:0 win over hosts Denmark. The very next day, he scored three more goals in another 10:0 win, this time beating Finland as Canada qualified for the 2017 IFCPF World Championships. Then on Monday 1 August, he scored his third consecutive hat trick - a first in Association history - as Canada won 7:0 over Japan. Charron's four goals equalled the team's single-game record, giving him 22 goals in 28 international matches since 2012. Amazingly, Charron is still just a teenager, currently enrolled at the University of Ottawa where he is taking international commerce classes in the nation's capital. In terms of his experience on the pitch, though, he is already one of Canada's leaders, a mainstay in national program since he was 14 years old. In Denmark, Charron has worn the captain's armband while Dustin Hodgson makes his recovery from a 2015 injury. It's a big honour and an important task in a group mixed with teenagers and veterans. "The trust that the coach (Drew Ferguson) has put in me has given me that extra boost of confidence," said Charron. "At a young age, I am taking those responsibilities and helping the team as best as I can. I wear (the captain's armband) with pride." Charron knows what an honour it is to wear the #CanadaRED, with the Para Soccer part of the larger family of Canada Soccer's national teams. He also knows what the #CanadaRED program means to the fans, as he got to experience it firsthand earlier this year at BC Place. "It is surreal how the sport of soccer has just boomed in the last few years," said Charron who attended the 25 March record-setting Canada Soccer match in Vancouver (the Para Soccer team was in camp in nearby Richmond). "To be part of the fans, to see it from that perspective, it was one of the greatest experiences I've had as a fan. "It was incredible just seeing the Voyageurs supporters in behind the net - we need more fans like that!" Charron has come to know that the #CanadaRED support is always there - no matter where Canada plays around the world. It will be there on 3 August when Canada faces Venezuela at the Vejen 2016 Quarterfinals, a rematch of last year's 1:2 loss in the Parapanamerican Games Toronto 2015. "The younger core was still young, they needed to step up and maybe they were not quite ready," said coach Ferguson, who was missing all-time leading goalscorer Trevor Stiles for that bronze medal match (29 goals, now only seven more than Charron). "They are just a year older, but that makes a difference. They are playing like very mature players right now." Charron believes that younger core is ready to spread their wings, both in the knockout phase at Vejen 2016 and in the upcoming IFCPF World Championships in Argentina in 2017. In the three group matches in Denmark, 24 or Canada's 27 goals have been scored or assisted by a teenager. The leaders are Charron with 10 goals and four assists and 19-year old Liam Stanley with six goals and four assists. "It's great seeing that we have so many young guys coming through the ranks right now," said Charron. "It's a great feeling knowing that our program will be set for many years to come." Into the next phase of the tournament, no one is expecting Charron or his teammates to score another hat trick - the last five Canada-Venezuela matches have all been two- or three-goal games (with Canada 3W-1D-1L across that series). Regardless of the score, Charron will be playing with one result in mind: another #CanadaRED win. "We've grown as a team since last year," said Charron from Denmark. "We're young, fresh, and ready to play." Back home, #CanadaRED is ready to support them all the way to Argentina 2017. Canada's Para Soccer Team competes in several global competitions over a four-year cycle, including the International Federation of CP Football's biennial World Championships. Canada also strives to compete in the America's Cup, the Parapanamerican Games, and the Paralympic Games. In past editions of the IFCPF World Championships, Canada finished 10th in 2015, 12th in 2011, 9th in 2009, 12th in 2007, and 11th in 2005. The next edition takes place in 2017, with the qualification tournament in July-August 2016 in Vejen, Denmark. Canada's Para Soccer Team is made up of athletes who have cerebral palsy or have had a stroke or brain injury.